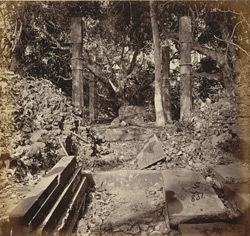 Photograph taken by John Henry Ravenshaw in c.1871 of remains in the jungle at Devikot, the ancient city of Bannagar, now in Bangladesh. In his 'Descriptive note of the photographs of ancient architectural remains in Kantonugger and Bannugger, Bengal pub. proc., no. 26 of October 1871, Ravenshaw wrote, "Three views show the remains of the tomb of Sultan Shah, Bannugger. The stones lying in the foreground and the pillars tally with the drawings in Martin's India, page 662. In Dr Buchanan's time the drawing was probably standing as represented by him. The tomb is very difficult of access, and is buried in dense jungle. The two pools of Amrito and Jivot are in the vicinity, but are mere jungle-holes, and not fit subjects to photgraph. The image of the bull taken out by Dr Buchanan's pundit is still in existence in Dinagepore. I will take an early opportunity to photograph it and send copies."